I made three batches of shortbread yesterday. Yes, I'm a little nuts. It's the last day of posting holiday cookie recipes around here. After jam tarts, gingerbread men, coconut sugar cookies, cannolis, plus 8 more, you think I'd be done. That's an even dozen, right? So I could have stopped. I have to admit — I'm a little exhausted. After I finish this post, we can leave for the city and do our first Christmas shopping. (shudder.) Perhaps no one would have screamed if I had let go. I promised you shortbread, and I just couldn't put up a recipe until I knew it in my hands, until I could explain what worked for us, and hopefully guide you to making shortbread in your kitchen. That's all this is about: you baking in your kitchen, with your kids, your friends, with good music playing. And the joy we can give people with a few flaky bites of shortbread. Besides, we had to make this. A few weeks ago, we met Gabrielle Moorhead, who is one of the forces behind Grand Central Bakery. We all met at the Tom Douglas cookbook social, where we made baguettes with curried red lentil puree. (They were a hit.) Gabby and I started talking, animatedly, about baking and food and family. Her father, it turns out, was recently diagnosed with celiac. He's doing well, but he misses certain foods. Mostly, his grandmother's Scottish shortbread. I couldn't resist this. I had to make it for him. Baking is so much more than following a recipe. In fact, I think you have to make a recipe once just to understand its dance: preheating the oven, then combining the flours and gums and salt. Do you cream the butter and sugar? Or melt the butter? Do you knead the butter with your hands? White sugar or brown? Flaky or fluffy? Which do you want? What story is this cookie trying to tell? That's why I have been so happily absorbed these past few weeks, with my hands in the flours. This is work beyond words. It's about feel and instinct and trusting yourself and being in the moments and whistling while you work, the magic combination of pushing and acceptance, listening and wishing, watching for the sugar and butter to become one, and starting over if none of it works, without any fuss. I love baking with all my heart. And if you can give a man his grandmother's shortbread back? The flaky layers and crisp crust, the mild sweetness, the way it melts on the tongue? So much the better. You want to try it? Here you go. The original recipe makes a LOT of shortbread. Since I was making three different batches yesterday, I cut this one in half, the ratios you will see here. If you want, you can easily double this. Preparing to bake. Butter a half jelly roll pan. (A jelly roll pan is a baking sheet with sides.) 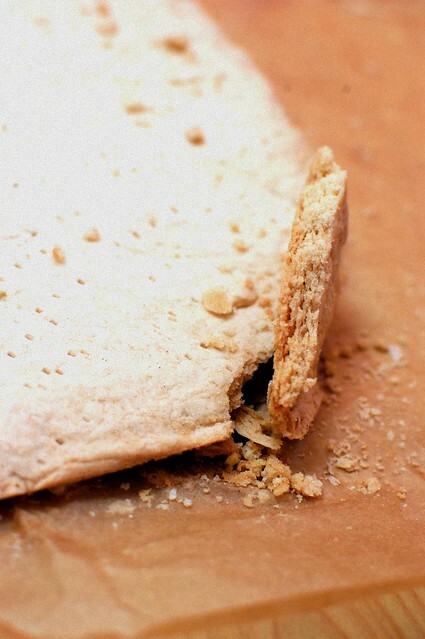 Carefully lay down a piece of parchment paper, with enough to leave some hanging over the edges. Press it into the buttered pan, taking care to leave no wrinkles. Butter the parchment paper. Set aside. Making the dough. Put the flour, xanthan gum, guar gum, white rice flour, sugar, and salt into a large mixing bowl. Whisk them together to combine and aerate. Cut the butter into small chunks and add them to the flour. Using your hands and patience, knead the butter into the dough. Think pie crust. Think about massage. You are trying to coat every part of the flour with fat. Work with purpose — you don't want the butter to grow too warm. When the butter is fully kneaded into the flour, you are done. Press the dough into the buttered parchment paper. It might be crumbly at first, but you can press it together. (If you don't have a half jelly roll pan — and we don't! — fill only half the jelly roll pan.) When it is all pressed in, put another piece of parchment paper over the top and roll the dough smooth with a rolling pin. Baking the shortbread. Preheat the oven to 300°. When it is fully heated, remove the jelly roll pan from the refrigerator and slide it into the oven. Bake until the edges are lightly golden brown and the top of the shortbread set, about 45 to 60 minutes, depending on your oven. Remove the shortbread from the oven. Cut into the lines you scored before baking. Allow the shortbread to cool before eating. And there you have it. Gluten-free shortbread. Yesterday, when I was playing around with recipes, I was a little dazzled by all the choices for shortbread recipes. Some say to use only cold butter, others insist it must be room temperature. Some even say to melt the butter. Some call for just all-purpose flour. Others say to add white rice flour (an old Scottish trick) for crispness, and others say to add cornstarch for softness. There seems to be no agreement. So I had to make another batch, this time using cornstarch for softness and room-temperature butter so soft that the directions call for it to have the texture of whipped mayonnaise. Oh my. 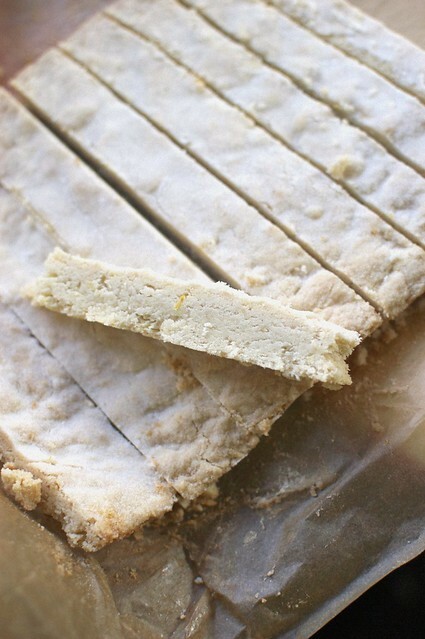 Meyer lemon shortbread, soft without being dense, wonderfully tart on the tongue. Rather than typing out the recipe, I'm going to make you head over there. All you have to do is use 280 grams of our gluten-free all-purpose flour mix (or any gluten-free all-purpose flour mix you like) for the all-purpose flour in the original recipe, plus 1/2 teaspoon xanthan gum and 1/4 teaspoon guar gum. You see, that's all you need to do to convert all your favorite family recipes: use 140 grams of your favorite gluten-free flour mix for every cup of regular all-purpose flour, add 1% of the volume of flours in xanthan and guar gum combined, and then start baking. That's it. And after you have this in your hands and heart, you'll start making up your own recipes. Like we do here. Yesterday, even though I already had 2 successful shortbreads cooling on the dining room table, I pulled out the butter again. This time, I wanted to work with ratios and melted butter. Brown butter balsamic shortbread cookies with rosemary. And they were possibly the best of the three. Want to make some? 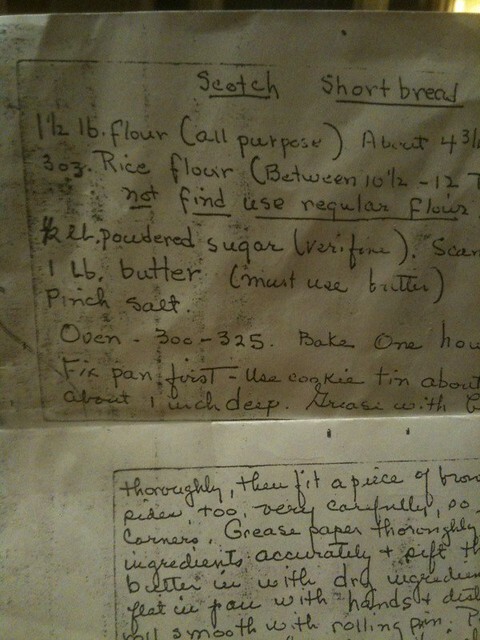 Just follow this, which is based on the standard ratio for shortbread cookies (1 part sugar, 2 parts fat, 3 parts flour). I have left it stripped down for those of you like Danny who don't want a recipe but a list of ingredients. This is what my notes look like when I'm making something up, so I thought this time I'd let you see it this way. If you have the ingredients, and you want the freedom of making this yourself without consulting a recipe, make these. So there you have it: gluten-free shortbread, three ways. It doesn't matter how you make it, really. It doesn't matter if your shortbread is imperfect. What matters is that you find that place of heart and hands, pushing and acceptance, and dancing in your kitchen as you bake shortbread for someone you love. Of course, the shortbread looks amazing. I just wanted to comment more on the fact that you do write and bake from the heart and it's obvious and it's appreciated! Now turn off your oven and relax for a few days, happy holidays! Looks Incredible! & thank you 100 times for the grams to cup gf to wheat flour conversion. You are amazing. Have a wonderful and well-deserved holiday with your family! THANK YOU so much. Shortbread! It's beautiful stuff, and I do miss it. I used to make it for breakfast in uni but it's somehow slipped my mind to try and make them now I'm gluten-free. Best of all? I can make them when I go home because I can't bring my stand mixer with me. Orange shortbread! And yes. Please, do take time to relax. You deserve a nice LONG period of it. Merry Christmas and love from this side of the world! Wow - thank you! I made gluten free shortbread the past two days using different combinations of flour mixtures. I'm still not sold on my recipe so I'm going to try yours. As the only celiac in my family, I want to make something delicious for everyone to enjoy. You've been baking up a storm!! Thank you so much--not even for the recipes necessarily (although they all look amazing and I will be baking some of them soon), but for the conversion trick. What I'm really wondering, though: Does that only work for baking? Or can I use this conversion to make my family's pierogi recipe? There is nothing I miss more since going GF than pierogies, especially at the holidays, and if I could make those, well I'd be one really happy woman. Wow!! You rock. Good luck shopping too! thank you so much for sharing all your wonderful knowledge with us. i have learned so much from you and am eager to keep moving forward. merriest of christmases to you and happy new year! Thank you for posting so many wonderful recipes, Shauna! You've inspired so many people to take control of their kitchens. Fearless gluten-free baking. Hi-five. Shauna, thanks for this. My mother-in-law is a Scot and she's always made this with the admonition that we were not to alter the recipe and especially not to use a butter substitute. But I did. :) I have to make things dairy free too, for my son. (I can have dairy but I feel bad making treats that he can't eat.) My previous attempt at shorbread (GF+DF) was "OK" but not special. I am going to give your recipe a try, with my favorite DF substitute. I'll let you know how it turns out. BTW, weren't you going to master a dutch baby this year? I have been working on making a puffy dutch baby. All my results have been, sadly, flat instead of puffy. I honestly cannot wait to try these recipes! Ones I'm most excited about: lemon bars (my favorite), mexican wedding, and shortbread! I am working on converting a lot of holiday recipes for tomorrow and the next day, and I had a question--I'm confused about your directions in the "Holiday Baking 2010" post. When you say we can convert any recipe and you say to use "1% of the volume of flours used in xathan and guar gum"--I just really don't understand what that means...I would really appreciate some direction! Thank you Shauna! I hope that you are able to rest up even with having to make your own meals for these next two days! You are the best. thanks for posting this recipe! i can't wait to make these shortbread cookies! This is awesome! My Nana used to make the most amazing melt in your mouth scotch shortbread. Oh so good. Her recipe calls for fruit sugar - sooooo fine. Shauna, you're just so darn cook! Thanks for sharing your tips - and how easy it is to sub. I was wondering why you use both xanthan and guar gum? I'd love to know! Have a very merry Christmas and a GREAT rest. I am so glad I have discovered your blog, Shauna! Love the shortbread and all your variations. I made some GF cardamom shortbread recently and it was lovely but a little crumbly. I will add some xantham gum next time. My pics and recipe here: http://bakeclub.yolasite.com/index/frances-makes-ginny-s-cardamom-and-cashew-shortbread-gluten-free. I hope you may find something on my website of culinary interest to you. I wish you and Danny and Lu a wonderful Christmas and a very happy new year! Your writing, and your recipes, are so generous and inviting. Thank you for your kindness and for loving what you do. You give me courage to adapt our favorite family cookie recipes to GF! I love your books, hope you write a baking book someday, and I noticed your book was on Dorie Greenspan's cookbook list for this year.....holy cow! That is fabulous! Now you've really arrived! Do you think I could just use guar gum & not use xanthan at all when adapting recipes? I'm supposed to avoid corn & xanthan is derived from cornstarch. Heather, I think that shouldn't be a problem at all re: the guar gum. I used to have only guar gum in uni, and I didn't have problems that I recall! I love the idea of balsamic rosemary shortbread -- thank you! Whatever kind you bake, it's definitely shortbread time! I just love reading your blog...always leaves me so inspired. I have a shortbread receipe that I have used for years (before coeliac). The last couple of years I've tried various gluten free shortbread receipes, but nothing really worked, or tasted like my old favourite. So this year I used that receipe, replaced the plain wheat flour with all rice flour, and just a couple pf tablespoons of tapioca, and some xanthan gun to hold it all together. BINGO!!! Perfect shortbread, just like I used to make. Even the non-coeliacs couldn't tell the difference. I made 6 batches in a matter of days, some given as gifts on Christmas day, but the rest eaten by my chidlren. And now they want more....enough said! What lovely sounding combinations. Thanks for the break down of the recipes. I have a question about the pizza crust recipe in your book (the cracker variation). You top this before baking it, right? You didn't tell us -- what did Gabby's father think? Does he think it's a good shortbread?